Went out to Quabbin Park this afternoon with Matan and chanced upon this migrant Merlin moving along Winsor Dam wall giving very nice fly past views. 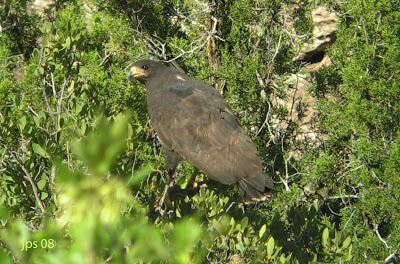 Other notable birds included a soaring immature Bald Eagle and a foraging Eastern Wood Pewee. The last few days have really seen the year turning to autumn with Common Nighthawks, Tree Swallows and especially Bobolinks appearing over the apartment regularly, almost daily in fact. 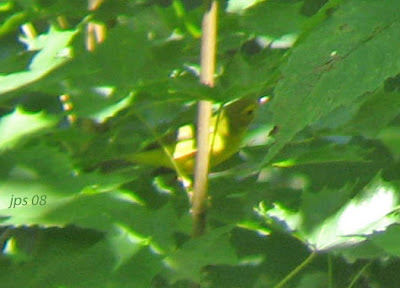 Around noon today a Red-eyed Vireo appeared in the yard across the street, and with it, a smaller faster moving passerine with much tail-flicking and bright yellow underparts - a Wilson's Warbler, the first real migrant of the fall. 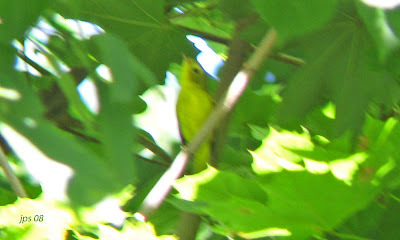 Quickly moving outside I was able to grab a couple of poor quality digibin shots which I think is our first Wilson's Warbler seen from the apartment on North Whitney Street. 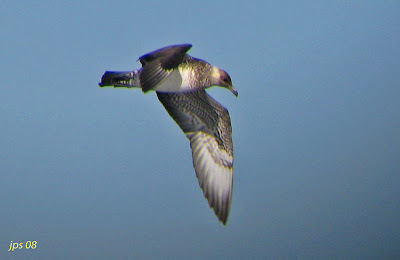 Pomarine Jaeger, vicinity of Atlantis Canyon, MA - August 23rd. 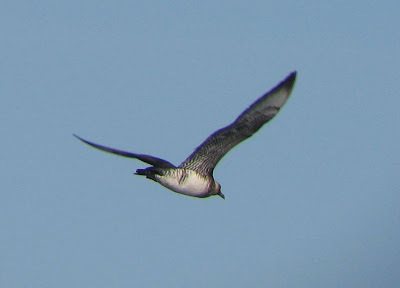 Sub-adult Pomarine Jaeger - Good prolonged views on the most recent BBC Extreme pelagic. 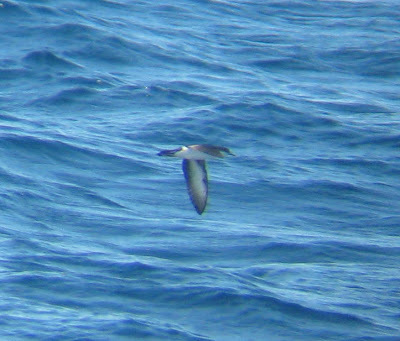 Audubon's Shearwaters, vicinity of Veatch's Canyon, MA - August 23rd. 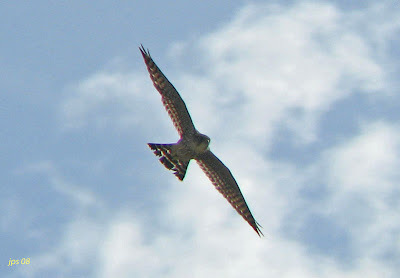 Nice view of the dark undertail coverts. 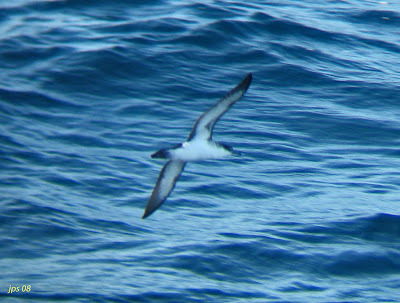 Image selection from about four Audubon's Shearwaters seen on the most recent BBC Extreme pelagic, all of the identified birds coming from the mid-to-late afternoon period. 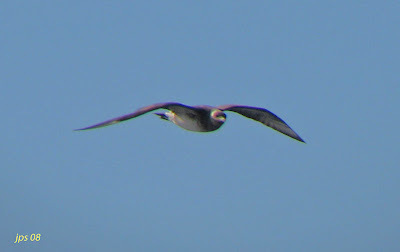 A fifth bird seen earlier in the day went down as an unidentified small black-and-white shearwater. 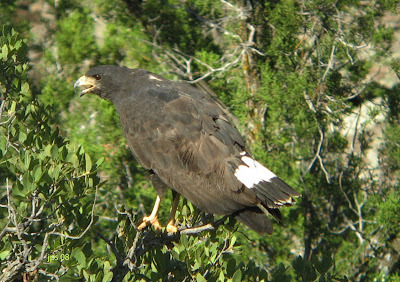 Common Black-Hawk - Adult in Sycamore Creek, July 24th, 2008. 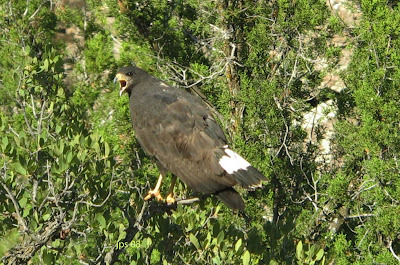 With a few hours to kill as I waited for my tour group to arrive in Phoenix, this adult Common Black-Hawk came as a welcome find on a hot afternoon. 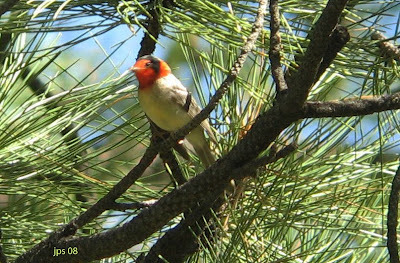 I'd headed north for a few hours to escape to heat of 'the valley' and found a number of good birds in the Sycamore Creek and Mt.Ord area, including some of my best views of this species. 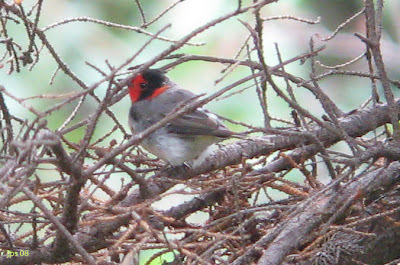 Red-faced Warbler - Greer, Apache Co., AZ - August 4th, 2008. 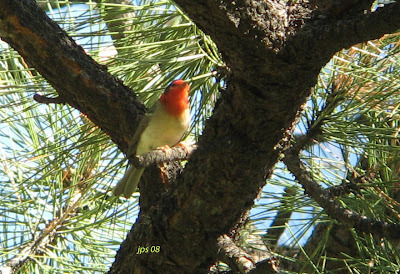 Red-faced Warbler - South Fork, Apache Co., AZ - August 3rd, 2008. Just back from another hugely successful tour of Arizona. Our tour loop comprised of about 2500 miles beginning and ending in Phoenix, and visiting key areas and habitats in the Central, South-Eastern and Northern part of the state. 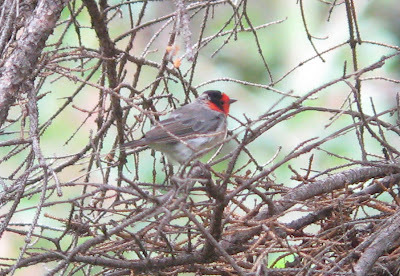 The diversity of species recorded (250 species) was surprisingly high for two weeks in a land-locked state, with all of our group contributing to some excellent bird finding. A personal highlight of the tour was a rufous morph Jaguarundi caught in the headlights on the way home from night birding in California Gulch. It was seen well by about five of our party in the lead bus, but missed by the second vehicle. Jaguarundis are apparently very rare in SE Arizona and we were extremely fortunate to have such good, close views of this squat, stocky looking cat, no matter how brief. 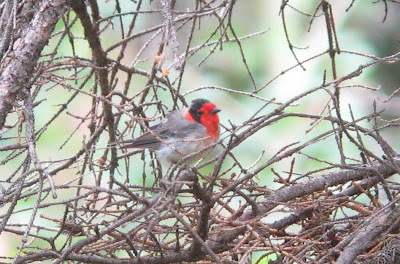 We also had a great tour for seeing Red-faced Warblers. 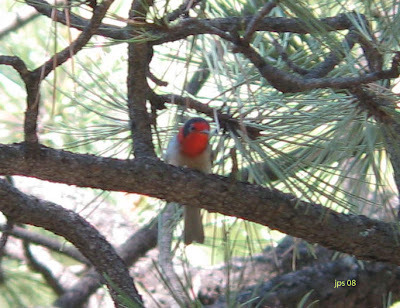 We found them on at least five days of the trip, the best observations being in the White Mountains area in Apache County. 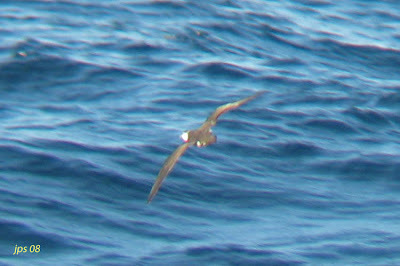 Leach's Storm-petrel, Atlantis Canyon area - July 19th. 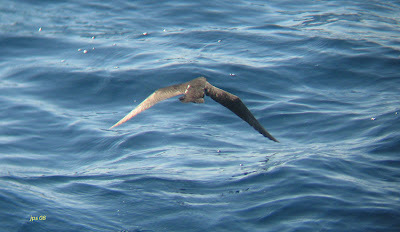 Another highlight of the BBC Extreme pelagic on July 19th was the 'storm-petrel' show, with three species of black-and-white storm-petrels identified. 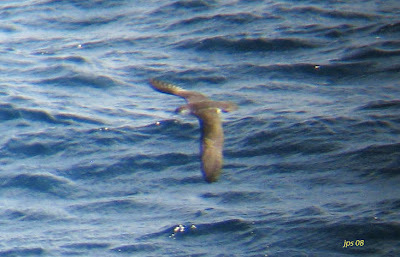 Unfortunately, I couldn't come up with any presentable shots of the two Band-rumped Storm-petrels that I saw that day but did grab a few digibin images of one of about five Leach's Storm-petrels identified. On personal level I found picking out and identifying the scarcer storm-petrels from the numerous Wilson's especially difficult making me realize that I need a lot more experience at sea. On the other hand, it became pretty clear that a thorough 'grilling' of a resting flock of Wilson's could well yield something scarce or rare. Hopefully, I'll be better prepared for the next extreme pelagic! Just a reminder that all of the images on the blog can be enlarged with a single click on the image. 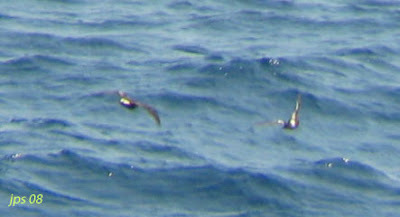 Leach's Storm-petrel - Extreme right bird, amongst resting flock of Wilson's. At rest appeared larger, more uniform brown with a different head/bill shape, the bill being proportionately longer, more slender and drooping. 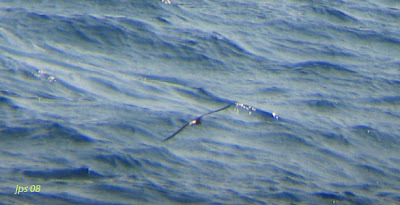 Leach's Storm-petrel - Upper center; Obviously larger than Wilson's, and in this shot, shows quite deeply forked tail. 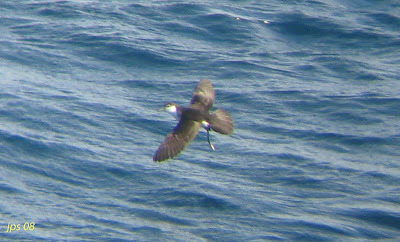 Leach's Storm-petrel - Left; gliding on long, bowed wings with diagnostic rump pattern (white rump split by gray-brown central stripe). 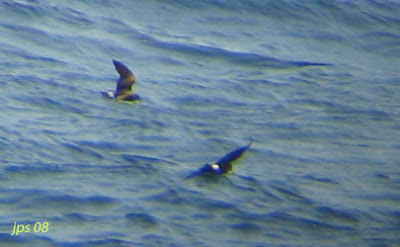 The storm-petrel on the right appears to show a bizarre white blaze on the underwing (suggestive of European Storm-petrel) which I'm assuming to be some sort of photographic artifact. 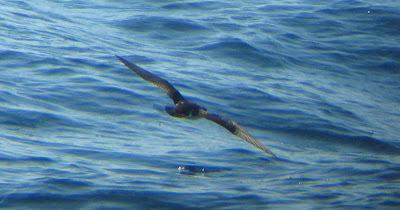 Leach's Storm-petrel - Left; poor shot but different wing shape and divided rump pattern of Leach's still evident. 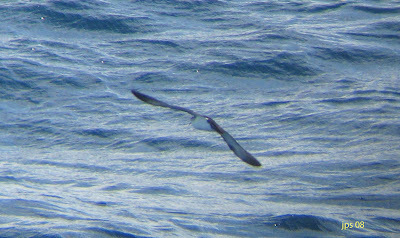 Leach's Storm-petrel - Looks much longer winged than Wilson's in this shot lacking the stiff-winged appearance of that species. The divided rump pattern is also just visible.